In September 1914, Colonel Claude Lowther, the owner of Herstmonceux Castle in Sussex and MP. 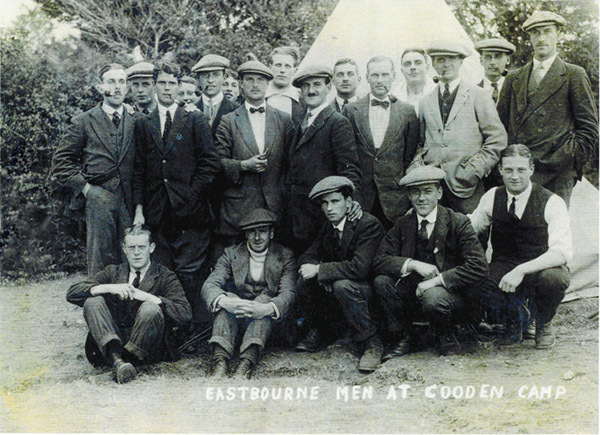 for the Eskdale constituency in Cumberland, received permission from the War Office to raise a Battalion of local men. He set up recruitment offices all over Sussex, but principally in the seaside towns of Hastings, Bexhill, Eastbourne, Brighton, Worthing and Bognor. Recruitment started on September 9th. Within two days 1100 men, from all walks of life, had volunteered. Originally designated the 9th Royal Sussex they later became the 11th, the first Southdown Battalion, a further two Battalions were raised by the end of the year, most of whom were from true Sussex stock. After further training at Detling, Kent and at Witley Camp in Surrey, they sailed for France on March 4th 1916, landed at Le Havre and proceeded to Fleurbaix, France, a front line sector, for instruction and further training. They suffered their first casualty eight days later, on the 12th, when SD.1026.David Thomas Dunk was shot and killed by a sniper; he came from Salisbury Road, Bexhill-on-Sea, Sussex. On the 30th June 1916, in what was described as a 'diversionary' attack to distract the enemy from the great Battle of the Somme, which was due to start the following day, the 12th and 13th went over the top at Richebourg, France. The casualty list at the end of this disastrous day was 365 men killed or missing, and over 1000 wounded. Company Sergeant Major Nelson Victor Carter was awarded a posthumous Victoria Cross for his gallantry on this day. In August they moved down to the Somme and suffered terrible casualties at Beaumont Hamel and Thiepval. On November 17th 1916 they moved to the infamous mud of the Ypres Salient and took part in the battle of Passchendaele, by the end of 1917 there were very few of the original "Lambs" left. The 12th Battalion were disbanded in February 1918, the remaining men were sent to other Battalions of the Regiment. The remaining two Battalions were virtually wiped out in the German offensive in the Spring of 1918. The 11th was later reformed and sent to Russia until 1920.